Everyone knows I hate cutesy intentional misspellings. 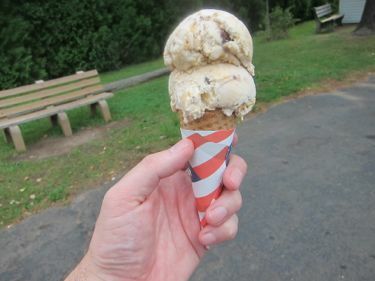 This issue seems epidemic in the Connecticut Ice Cream scene. But let’s be honest, if the ice cream is good, we can move past that issue. And fortunately for this venerable joint, it is. 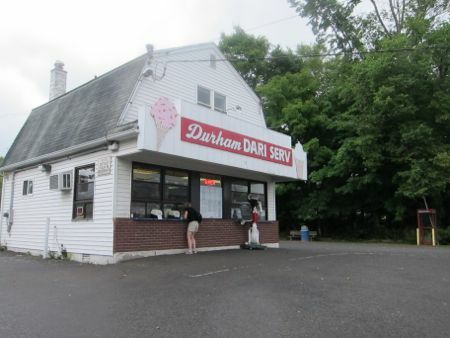 I learned of Durham Dari Serv when I did may annual posting of my “Homemade ice creams in Connecticut” list on facebook. Someone mentioned it, I noted it, and then I went and ate some ice cream there. End of story, I guess. If only. (For you, not for me.) I ended up here one day because my original plans fell through. Those plans included taking a ferry out to a lighthouse down in Guilford. People can visit Faulkner’s Island Lighthouse only a couple days per year, and I was very excited about having reservations. Unfortunately, on an earlier ferry, a 90-something woman stumbled over when the boat rocked a little bit, smashed her head, and caused a bit of a medical emergency. For some inexplicable reason, the whole morning’s ferrying was canceled. Many of us thought that was ridiculous, but … I hope the woman was alright. This place is at that wacky confluence of route 17, 79 and 77 in Durham. I’ve always sort of enjoyed driving south down 17 and coming upon that choice. Do I take 17, 79 or 77? I’d guess people take the wrong one a lot. “Did she say to take 17, 77 or 79? I think I remember 77…” Hey, at least that hypothetical person took the prettiest route. Going to a new food spot with a billion choices is great. Going to a new food spot with a billion choices – with no line – can actually be annoying. 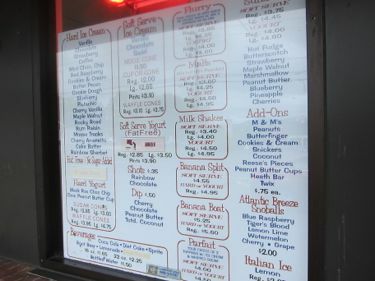 There I was, staring at the list of ice cream flavors, with a super nice young woman staring back at me from inside. I get nervous. Total “Paradox of Choice” anxiety. OMG, OMG, OMG… Um, something with chocolate and peanut butter. Stop smiling at me, kindly high school girl. I DON’T KNOW! I’VE NEVER BEEN HERE BEFORE! I JUST GOT SCREWED OUT OF SEEING A LIGHTHOUSE ON AN ISLAND! So yeah, I got some sort of chocolate peanut butter and vanilla thing. And it was delicious. 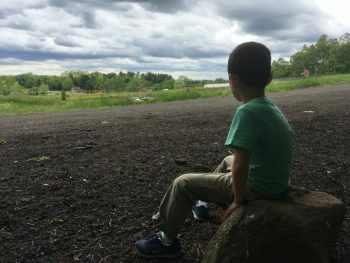 When I got home, and Hoang saw the “selfie” of me, alone in a rainy parking lot, looking angry while enjoying an ice cream cone, she laughed at me and my plight – but then realized I had had delicious ice cream and she hadn’t and then she got mad so I went to the store to buy her ice cream. In the end, I’m not even positive this is homemade ice cream. I’m assuming it is, but the Patch articles I skimmed about Durham Dari Serv never mentioned where the good stuff came from. Oh well, it’s a cool place that ONLY sells ice cream and soda. No hot dogs or burgers to muck up the works. But it still should be “Dairy Serve,” gosh darn it.